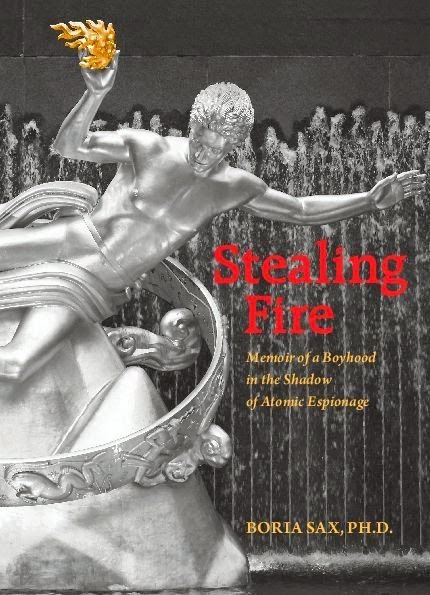 Boria Sax, adjunct professor of philosophy at the University of Illinois Springfield, has published a new book about his father and childhood entitled Stealing Fire: Memoir of a Boyhood in the Shadow of Atomic Espionage. The book details how his father, Saville Sax, recruited Theodore Hall when they were undergraduates at Harvard and began passing atomic secrets to the Soviets. Their acts of espionage could have led, as in the case of Julius and Ethel Rosenberg, to death in the electric chair. But unlike others (Klaus Fuchs, David Greenglass, Morton Sobell) they were never even tried for what they did, let alone convicted. Professor Sax is an eminent scholar in the field of human/animal studies and the elder son of Saville Sax. In the book, he relates his stressful experiences growing up in a troubled home, one in which his father lived in constant fear of the FBI. It was only as an adult that Professor Sax came to fully comprehend the magnitude of his father's deed, one he does not condone. As a result, he can now relate how Saville Sax's puzzling behavior affected every member of his family, and the price each one had to pay. This very personal memoir is also an account of a Russian Jewish community that settled in the United States, torn between the desire for continued intimacy and the need to assimilate. The examination of social and political events over several generations invites readers to reflect back on their own experience and its implications. Professor Boria Sax has published more than a dozen books, many of which deal with animal folklore. He is also the author of Animals in the Third Reich depicting the complex and insidious views of the Nazis and their impact on the German people.